Sleepwalking is often portrayed in movies, on television, and even homemade Youtube clips in either one of two lights: hilariously funny or supernaturally terrifying. But for the sleepwalkers themselves and the loved ones they share a home with, the reality of sleepwalking may be found somewhere in the middle. Many sleepwalkers themselves and their loved ones do tend to laugh about the sleepwalking episodes. Witnessing someone getting up in the middle of the night to push a powerless vacuum around the house, or doing invisible dishes in a sink can appear somewhat amusing. However, most of the laughter carries an undertone of apprehension and nervousness. Laughter that suggests what has happened before may be amusing, but hints at the fear of what could happen during future episodes. Sleepwalking generally occurs during the early stages of deep sleep during slow wave non-rapid eye movement (NREM) sleep, but can also occur in the lighter stages of NREM sleep. Sleepwalking does not happen during REM sleep because muscle atonia prevents the body from acting out dreams. Symptoms of sleepwalking (formally known as somnambulism) can range anywhere from sitting up in bed and looking around confused, to simple automatic behaviors like walking around the house performing mundane chores or activities, to even complicated actions like leaving the house and driving away. Sleepwalking is much more common in children than adults. According to the American Academy of Sleep Medicine, up to 17% of children sleepwalk. Sleepwalking occurs in both boys and girls and most prevalent in age ranges 3-7. There is believed to be a genetic element to sleepwalking as up to 80% of children who sleepwalk have a family history of sleepwalking. Adult onset sleepwalking is not uncommon and is not usually associated with psychiatric or psychological problems. Approximately 4% of adults sleepwalk. Sleep is interrupted or fragmented. Caused by another sleep disorder (More frequent in children with sleep apnea and nocturnal enuresis). Injuries from sleepwalking are the greatest concern for sleepwalkers. Common injuries include bruises, lacerations, nosebleeds, and occasionally more severe injuries from tripping, falling, bumping into walls. When sleepwalkers become violent while asleep it can also result in injury to loved ones. Most children that sleepwalk often outgrow the disorder by the time they reach adolescence. 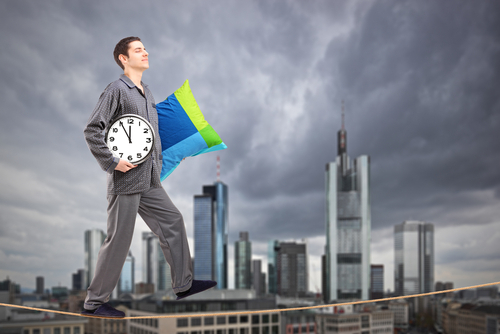 It's important to talk with your doctor about diagnosing and treating sleepwalking if your symptoms are frequent; cause frequent injuries or are potentially injurious; results in daytime sleepiness, fatigue, insomnia, depression, anxiety; cause decreased quality of life; or last beyond the teenage years. If you or a loved one believe that sleepwalking is becoming a growing concern, you may want to schedule a sleep study to help find the cause of the disorder and to get suggested therapy treatment options. If you live in Alaska and a sleep disorder is becoming worrisome, contact The Alaska Sleep Clinic to receive a free 10-minute phone consultaiton with a sleep educator by clicking the link below.